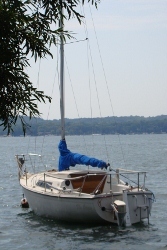 It looks like it was damaged from the keel swinging too far forward and contacting the forward part of the trunk. I think this is fairly common, happens when the cable brakes. I did a small repair on mine in that location. Mine didn't compromise the hull at all just exposed a few layers of glass. Its hard to tell how extensive the damage was on yours, that's a sloppy repair. I don't think it will be a problem. Your keel pin/bracket is some sort of homemade job. It looks like a long bolt or threaded rod was used for the pin. I can't comment on how well that set up will work, but it is worth keeping a close eye on. Watch for leaks in that area. The Patch on the bottom doesn't look like any glass was added. Just ground down and possibly coated with epoxy? I'm not sure why the hole was drilled through. Maybe they were installing a through hull and drilled the pilot hole in the wrong place. I would probably redo that patch with a few layers of glass. 70's Barnett Butterfly "Blue Jean"
I apologize, when I zoom in on the photos I can now see the glass mat. Be sure to post some photos after bottom paint and a good deck wash. That should make for a dramatic before/after set up. Something bothers me about this marina. Who gave them permission to drill a hole in the boat? I don't care if it's easier, who's going to pay for the repair to the boat caused by their policy? Personally, if at all possible, I'd find another marina because that's just not right. I can't say much about the rest except that the forum has postings that cover most of the questions you asked. I took an entire day and read every single posting made to the board. I found lots of useful bits of information. If the marina drilled the proper size hole to drain it, it would be simple to just install a drain plug or other through hull fitting with valve. 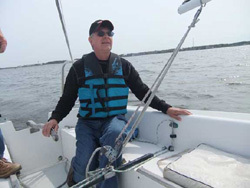 Here are my keel repair videos. This is late and at the end of a string of comments but I have something to add. I got my boat 7 years ago and - in ignorance - wound out the winch cable until I heard a crunch. I winched in some wire, sailed it for a week and during that week I remember being quite annoyed that water was entering the hull on the boat I had just purchased. 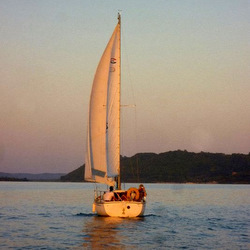 I have spent all my time since that first sail with the boat on the hard, being re-built. I never did find that leak though, until just several years ago while I was lying under the boat, planning how to drop the keel. Water (rain water in the boat) started dripping on my forehead from a hairline crack, fore-end of the keel trunk. I poked and probed until I had a large hole, previously packed shut by someone with something. After opening the hole up until the patch was all removed, I put in as many layers of fiberglass as it took to build back to hull thickness, and then added a few more layers spread further out on the hull and up the trunk front. Since that time, and this is why I am posting, I found a Chrysler document complete with information on how many winch turns it takes to lower the keel to a specific angle, 60 degrees being the lowest the keel should ever be allowed to drop. I am in the process of making a sign with that information and installing it near the winch so there is no doubt how to have the keel at the angle you want. Here is the link to that document. Good information to have on hand in the boat.